Lavender aka Lilac is the new millennial pink this year. This pale purple hue is refreshing. Known as one of the trending colors this spring season, lilac/lavender is a must-have. This pastel hue is another way to add color to your work style this spring. The subtle color makes it easy to style and incorporate with other work neutrals. With the different lavender tones and preference (light or deep lavender tone) you can easily pull it off with neutral color tones and it also goes well with different colors such as canary yellow, emerald green, dark purple etc. There are different ways to style this year's statement color. You can either pair it with different bold colors, jeans or monochromatic. 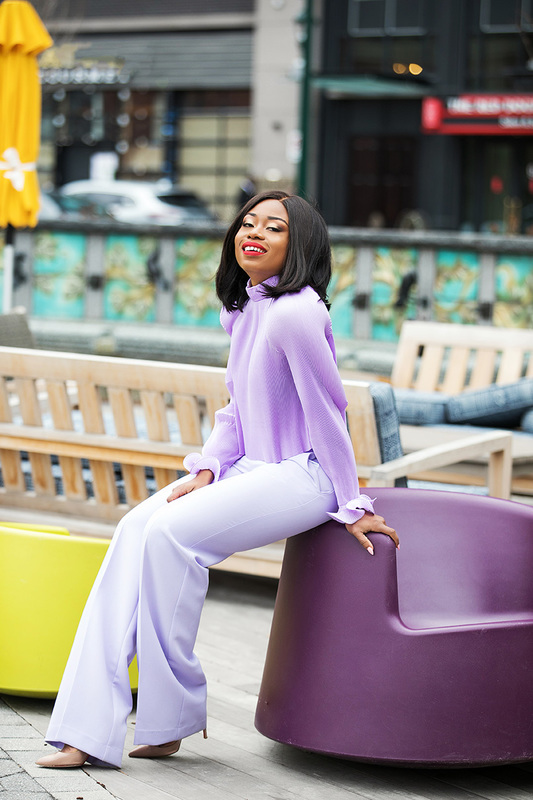 Pulling off a monochromatic lavender look this spring can be achieved by styling different shades of the color as seen in this post. For today's look, I went with a deeper tone lavender top and a lighter shade for the pants. For contrast, bold lipstick can be easily incorporated. Sometimes color can be something we fear, but this subtle feminine hue is a great place to start. Wow that is one of the best lavender outfits I've seen this season! You have great style.